For technicians and IT professionals, SUPERAntiSpyware Technician Edition enables you to detect and remove malware from PCs, even when you can’t access the Internet. Up-to-date Definitions. Detect and remove threats from spyware, malware, ransomware, and more. Runs Without Internet Access. Technician Edition can run via USB drive or CD/DVD drive. No Installation Necessary. No need to install the program on the system in order to run it. Leave nothing behind once it’s removed. 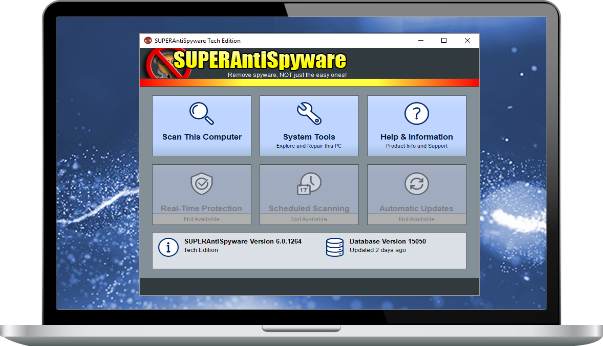 If you would like to run the SUPERAntiSpyware Technician Edition in a corporate or academic/non-profit organization, please contact us for licensing options and a custom quote.